One date in the Carson City dime series is exalted above all other dates. This is the Unique 1873-CC Without Arrows variety. In 1915 this coin sold for $170. In 1950, Louis Eliasberg, Sr. paid $4,000 for it. In 1996, Waldo Bolen bought it for $550,000. Rusty Goe bought it for $891,250 in 2004 and sold it several months later for around $1 million. Today (in the second decade of the 21st century) it is worth $3.5 million. Only about ten people have had the privilege to own this special coin. It is by far the rarest surviving memento from the Carson City Mint. Other rarities in the “CC” dime series are the 1871-CC, the 1872-CC, the 1873-CC With Arrows, and the 1874-CC. Only two dates comprise this short-lived series in the Carson City coin collection, the 1875-CC and the 1876-CC. It is estimated that fewer than 10,000 examples exist of the first date in the “CC” twenty-cent piece series, and fewer than 20 examples of the legendary 1876-CC date. A set of Carson City quarters consists of nine pieces, one of which, the 1873-CC Without Arrows, is the second rarest coin from Nevada’s colorful mint. The With Arrows variety of the 1873-CC date is a rarity in its own right. All three of the first three dates in the series, the 1870-CC, the 1871-CC, and the 1872-CC, are extremely rare, especially in grades above Very Fine. Over 5.3 million half dollars were produced at the Carson City Mint between 1870 and 1878. of that total it is estimated that no more than 20,000 examples survive, the majority of which are represented by two dates, the 1876-CC and the 1877-CC. The most desirable date in the “CC” half dollar series is the first-year-of-issue 1870. The rarest date, however, is probably the last-year-of-issue 1878, with the 1874-CC a close second. 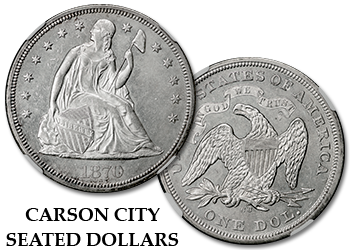 The Liberty Seated dollar has the distinction of being the first denomination delivered by the newly opened Carson City Mint in 1870. The large silver coin would only be minted for three more years at Carson City. The final year of issue 1873 is considered the scarcest date in the “CC” Liberty Seated dollar series. The lowest mintage coin of all denominations struck at the Carson City Mint is the 1871-CC Seated dollar, which is virtually tied with the 1873-CC for the rarest date in the series honors. 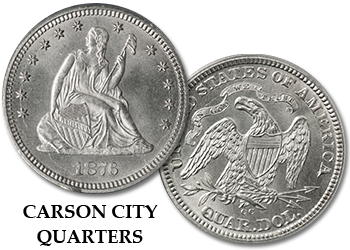 The Trade dollar was spawned by the so-called “Crime of 1873.” Silver from the Comstock Lode in Nevada was used to produce many Trade dollars at all the U.S. Mints in operation. Of the six dates struck at the Carson City Mint, two are considered very rare, the 1873-CC and the 1878-CC. 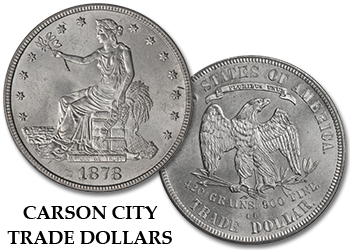 Numismatists worldwide recognize Carson City-minted coins as special items, with Morgan silver dollars being the most easily obtained “CC” Mint coin. 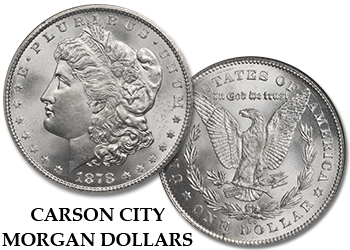 With thirteen available dates to choose from and hundreds of known VAM varieties, the Carson Mint’s Morgan dollar output supplies hobbyists with a wide array of choices for their collection. If you’re looking for a Choice BU specimen of a 1889-CC silver dollar, or you want to start out with a three-piece set that includes an 1882-CC, an 1883-CC, and an 1884-CC, check out our inventory. We also service want lists. GSA dollars are a special sub-category of the Carson City Morgan dollar series. History tells us that, a hoard of mostly Uncirculated “CC” cartwheels was discovered in the vaults of the U. S. Treasury in 1964. After several years of strategizing, the United States government decided to offer these Carson City silver dollars to the public via mail auctions. Sales began in 1972 and continued until 1980. In the first few sales, starting bids ranged from $3 to $30. Gradually, the minimum bids increased to $60, for the 1880-CC, 1881-CC, and 1885-CC dollars. A special sale of the 1879-CC dollars in 1974, posted a starting bid of $300. By the time the GSA conducted its final two sales, in 1980, minimums ranged from $45 to $180. Shrewd citizens were able to purchase many of these selected “CC” souvenirs at near rock-bottom prices. Since then, many coins from the hoard have unfortunately been broken out of their distinctive government holders. The pieces remaining in their original packaging have had their legacy preserved. This adds to their desirability and their value. We offer many third-party-graded examples to choose from, as well as non-graded pieces. VAM varieties and coins with Proof-like and DMPL surfaces are also available. We have hundreds of GSA dollars in stock that aren’t on our Web site, so we’re sure to have just the one you’re looking for. Every GSA dollar we sell comes complete with its own original box and corresponding certificate of authenticity.